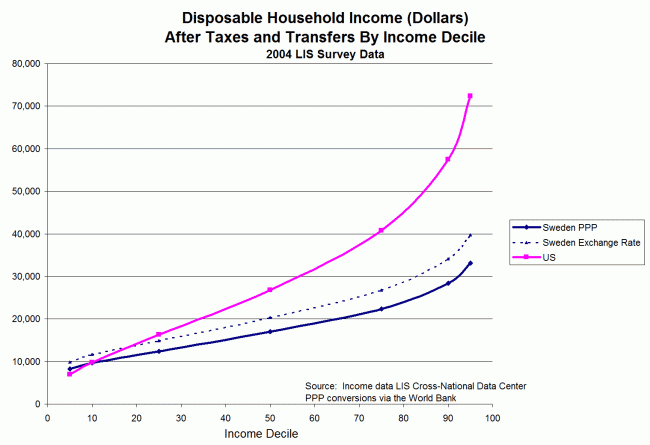 Coyote Blog » Blog Archive » Do We Care About Income Inequality, or Absolute Well-Being? Do We Care About Income Inequality, or Absolute Well-Being? I am going to reprise parts of an article I wrote in Forbes several years ago, because I think the conclusions are particularly relevant given the Democrats' discussion of income inequality and the Scandinavian economic model. When folks like Bernie Sanders say that we have more income inequality than Sweden or Denmark, this is certainly true. By just about any test, such as Gini ratios, we have a much wider range of incomes. However, we Sanders implies that this greater income equality means the poor are better off in these countries, he is very probably wrong. Because the data tends to show that while the middle class in the US is richer than the middle class in Denmark, and the rich in the US are richer than the rich in Denmark, the poor in the US are not poorer than those in Denmark. And isn't this what we really care about? The absolute well-being of the poor? I am not a trained economist or economic researcher, but I have looked for a while for a data source to get at this. I can find Gini ratios all over the place, but how do I compare the absolute well-being of poor in one country to poor in another? So the data had to be there somewhere. Finally I found a set of data that seemed to does the trick. I used data from the LIS Cross-National Data Center. I cannot vouch for their data quality, but it is the same data set used by several folks on the Left (John Cassidy and Kevin Drum) to highlight inequality issues, so I used the same data source. I then compared the US to several other countries, looking at the absolute well-being of folks at different income percentile levels. I have used both exchange rates and purchasing price parity (PPP) for the comparison but my feeling is that PPP is a better approach when we are comparing consumer well-being. What does this mean? If the data is correct, it means that all the way down to at least the 10th percentile poorest people, the poor in the US are as well or better off than the poor in Denmark and Sweden. And everyone else, including those at the 20th and 25th percentile we would still likely call "poor", are way better off in the US. All this talk about reducing income inequality by emulating Denmark is thus not about making the poor better off, but just about cutting the rich and middle class down to size. "And isn't this what we really care about? The absolute well-being of the poor?" Don't be silly. The Bernie Sanders's of the world need for there to be poor people. Interesting post, as usual. All this clatter about income inequality is nothing more than lukewarm Marxism. You'll note it always comes from the left. The left is for letting into America all sorts of people who have no education, are largely illiterate in their native language and completely so in English, have no marketable skills. Are these migrants going to get paid $70K per annum? No. Their very presence in the labor force is a variable that makes that income disparity ratio look more horrible. Most studies I've seen use the average salaries of the Fortune 100 CEO's and work down from there. Why stop at 100? Sure, many of these guys and gals get paid millions. But why not do an average of say, 1,000 corporations, or 100,000, or say, 1,000,000? Because such a comparison won't give you the answer you're looking for (cf. climate models). From what I understand, the average in-kind benefit to families on welfare in the US is something in the neighborhood of $53K. Even a liberal as liberal as Nick Kristoff @ the Times wonders if we haven't made not working too attractive, and thus, are abetting the behavior we claim to be trying to do away with. Also, I spend a fair amount of time in Europe. Yes, the 1% and 2% live like kings, as they do in the US. But the vast lot of Europeans make less and have less, and by good margins, than we do in the materialistic capital of the world. That knucklehead Sanders makes such a comparison only tells you he knows less about economics than he does about Soviet history. Give it away, Oprah. You too Streisand and Spielberg. My understanding is that "disposable income" measure money left in your pocket once taxes and mandatory contributions have been paid. But it doesn't measure things like cost of education, housing or health care which in Scandinavia are heavily subsidized. Ibwould rather get 80 and free health care, education and public housing than a 100 and have to pay full price for all these. I hope you find data that lets us make those kinds of absolute comparisons of the poor across countries. I think your thesis has legs and it's a very valid question. But those countries subsidize health care, education and housing -- especially for the bottom 10%! You can't just pretend they don't. Why would you choose to hand-wave away the number one cause of bankruptcy (healthcare costs) in this country? LIS is absolutely the best information anyone has. And yes, I've used very much the same information (and at Forbes too) over the years, including that first chart. There is one small difference: at the first ventile (ie, 5%) Denmark does better than the US. But how important we think that is is another thing. I think more important than income inequality is upward mobility. 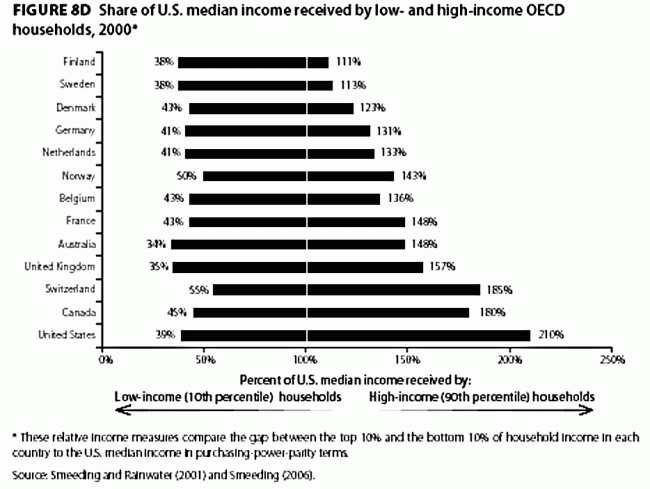 The idea that we have an "upper class" in the US is simply false. If you look at the top 1% tax rolls (there was an article on this somewhere) from year to year, the same people are not on them. Many people are only on them for a year or 2 when they cash in stock options, get an inheritance, sell a business, etc. Or they are in top % for a couple of years before they retire. In Europe, it is so hard to move up that many people don't try. Very hard to start a business (and US is moving that way, unfortunately). Very high unemployment of young people there. People on lifetime dole. Not what I personally want my society to do. Yes, rather than just spending your own money on whatever you want to spend it on, clearly it's more cost effective to send your money to the government, spend half or more of it on salaries of various federal employees, and then get the money back as subsidies you only get if you buy certain things. The standard riposte to this from the SJW types is that the other nations' citizens get a lot of Free Stuff that isn't accounted for in statistics like that which you use. Not sure what the proper response to this claim is. Don't worry, as long as the definition of poverty is defined in relative terms, there will ALWAYS be poor people. But the point is that this graph understimates Scandinavia's relative well-being, because it accounts for taxes, but it doesn't account for everything those taxes are paying for. Of course, that's never what the left brings up when arguing about income inequality, but I do think it matters here. Even if universal healthcare isn't as effective as privatized, we can't just ignore it, since it's a good that's purchased using tax dollars that were taken into account in the chart above. Instead of looking at numbers, the author should investigate those countries on the ground or read the work of those who have. All countries have their problems, but there is no doubt about whose poor are better off. Upward mobility is great when you are in your 30s, not so much when you are in your 60s and running out of time after the great recession has destroyed all you have worked for. I'm not sure of the answer. I'm a conservative, business owner, single dad in my 60's BTW. And whose poor are better off? I don't know who this "we" is you're talking about, but those pushing most for equality are pretty open about the fact that equality in poverty is preferable to inequality in wealth. The fact that the poor in an unequal society are in absolute terms better off than the poor in a more egalitarian society is utterly beside the point for them. Surely you are familiar with John Rawls A Theory of Justice? A more equal society is a more just society even if the members of the society prefer inequality. A social policy can only be considered good if it helps the poor at least as much as it helps the non-poor. If you were to offer to stand on a street corner handing out hundred dollar bills to poor people with the proviso that non-poor people would get two, Rawls and his adherents would flatly state that you are doing a Bad Thing and should be prevented from doing it. Not clear why you think upward mobility is bad if you are in your 60s. If there was good upward mobility during your whole life, by 60 your odds of being better off would increase. >the number one cause of bankruptcy (healthcare costs) in this country? That assertion is untrue and has been debunked many times. This article discusses a study in NY State that found that poverty survey respondents significantly under report benefits they receive. Tie this into the Coyote graphs above, and we may find that our poor (lower two deciles) are actually better off than those in other countries. Of course, the measures in other countries could be just as poorly done (no pun intended). Guess it is not just Rawls who is saying this but you are too, and you too would give (your definition of) "fairness" more weight over actual results. The fact is that the standard of living at the poverty level of the US is something that most in this world aspire to. Were it not so, why would millions seek to stay in this country illegally, and therefore have rather limited opportunities as they stay under the radar? Right. Upward mobility within a society is completely unrelated to one's (or group of) individual own opportunity set. Yep. People claiming that Nordic nations have better mobility are always talking about intergenerational mobility, which isn't relevant to the whole inequality/mobility issue at all. Mobility within one's lifespan is higher in the U.S.